A reusable cutlery set. Perfect zero waste dinning. 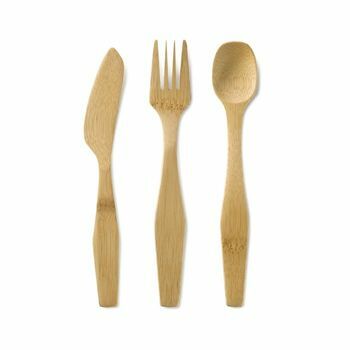 This set contains a bamboo fork, knife and spoon. Conveniently packaged in a stylish case with a magnetic closure. This beautifully finished cutlery set is perfect for taking on picnics or for zero waste dinning when out and about. Each utensil is made from a single piece of bamboo, then hand shaped and finished. Bamboo is more durable than wood and is heat & stain resistant. This set contains a bamboo fork, knife and spoon. Conveniently packaged in a stylish case with a magnetic closure. 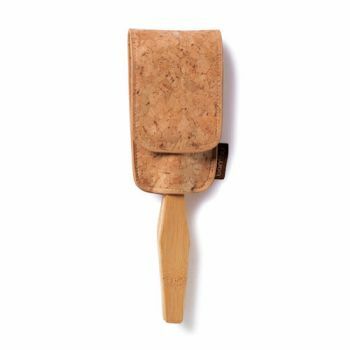 This case is made from cork fabric - an innovative material made from a thin layer of cork applied to a cotton backing. The cork fabric is amazingly supple and tactile, with a lovely matt finish and a smooth feel. It is also very durable, anti-microbial, water and stain resistant. It is also machine washable so is great for putting dirty cutlery into after use while out and about. The cutlery can be washed in the dishwasher however, as with wooden products, we recommend hand washing to prolong life. The case can be machine washed on a cold cycle. Case is 11.4cm x 6.5cm. Cutlery is 18.5cm long. Cork is renewable and biodegradable, one of nature's most remarkable resources. The bark of a cork tree is sustainably harvested every 10-12 years. It quickly regenerates and the tree continues to flourish, generally improving the tree's health and vitality. The tree plays a vital role in balancing the ecosystem. Cork forests are essential to preventing soil erosion, maintaining water resources and storing CO2. Cork trees live an average of 150-200 years.